Church of the Big Sky: Saddle up, lil' buckaroos! This is the Northern Snakehead (Channa argus). A native of Asia, it's considered a delicacy on it's own turf (and surf), as well as a component in some Asian medicines. 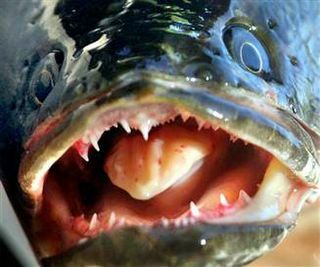 The nasty snakehead is not only an alien species to North America, but also a hungry, hungry predatory species. However, it was still completely legal to bring the critters into the United States in 2002 for sale in seafood markets. To ensure freshness, they were usually shipped live. Somehow, a couple of these ugly bastards ended up in the water supply here in Maryland. 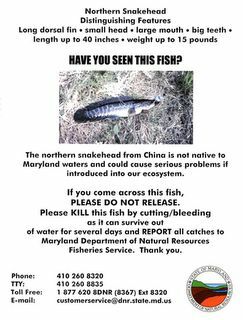 There are a couple of versions of the story of just how the snakeheads ended up in a pond in the small town of Crofton in 2002. (I love the fact that urban legends have grown up around this in such a short period of time - yes, I can easily confirm the true tale for you, but I like the whole urban legend aspect to this...) In one story, a Chinese gentleman here in Maryland went to a market to procure a snakehead for his sick sister, hoping to make a remedy from the homeland. By the time he brought it home, his sister was doing better, so this gent did what anyone would do with aquatic life that was no longer needed. No, he didn't flush it down the john - he dumped the ugly critter into a local pond. In the other story, a fish fancier paid a seafood importer in New York for a pair of these suckers, initially to make into a soup, but then, after a change of heart, kept them as his hideous aquarium friends. Eventually they grew too big and expensive to feed, and the ichthy guy dumped the ugly critters into a local pond. Either way, the voracious, predatory alien fish ended up in a pond in Crofton, Maryland, reproducing and eating its way through the rest of the pond's aquatic residents. A fisherman caught an 18-inch snakehead in 2002, and, puzzled by the strange creature, sent it to the state of Maryland. Aaaand the state of Maryland freaked out. These things could really mess up the state's ecosystem and eat their way into other states, too. The state wanted these things dead, for the Little Patuxent River, feeding into the Potomac, was just 75 yards from the pond. Why would this worry state officials so much this? After all, it's not like the fish were gonna get up and walk over to the river, right? Right? Well, my friends, you see... these Frankenfish can walk. That means that, after they've wiped out the stock in one big dinner bowl, they can crawl on over to the next one. Evil hungry alien fish... that walk. And, like the poster says, they can survive out of water for several days. So, if that next meal is a hefty walk away, the snakehead's totally cool with that. Freaky, huh? Despite the state of Maryland thwacking the living crap out of that pond in Crofton, with herbicides and poisons, it was too late. The crafty snakeheads had made their move. Now, the snakeheads are in the Potomac, threatening the bass population. Fishermen, regional authorities, and the federal government are none too pleased. 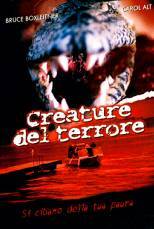 However, the snakeheads have helped another industry here in the United States: the crappy made-for-tv horror film industry! God bless the Sci-Fi Channel. God bless Bruce Boxleitner and former supermodel Carol Alt. God bless the special effects guys who toiled to make rubbery, bigger-than-human snakehead costumes. 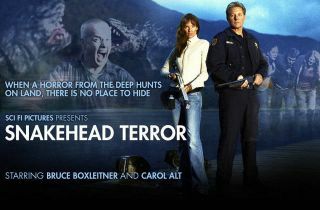 And god bless the producers who payrolled... SNAKEHEAD TERROR! Actually, that pond in Crofton wasn't that deep, but I guess that's nitpicking, right? 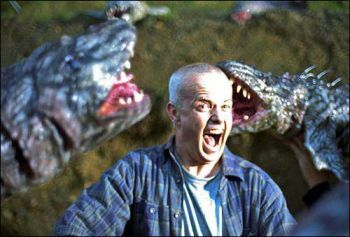 A brilliantly awful 2004 movie, Snakehead Terror takes the fishy danger of the walkin' Frankenfish to a whole new level. In this epic, the poison used by the state of Maryland only serves to mutate the fish into vicious man-eating behemoths. It's up to Sheriff Bruce and the aging supermodel to bring these fish to their knees. (Umm... if they had knees.) There's a wonderful review of this cinematic wonder here. Enjoy. Jesus. Just look at that terror! Look at those rubber fang-fish about to eat his head! Wow! Give that man a Golden Globe! This actually reads "Curse of the Dead Lake", which I think may have been a Nancy Drew title. I'm trying to imagine just how bad the dubbing is on this baby. This may not be as bad as exporting the actual fish to Italy and Russia, but... No. Wait. This is as bad as exporting the actual fish. I wonder if the Maryland Tourism Board knows about this? Visit scenic Maryland, the Free State, birthplace of Babe Ruth and home to GIANT KILLER FISH!!! 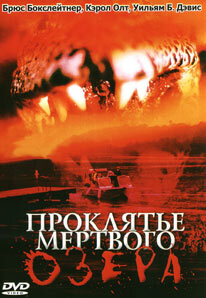 There's legislation pending to ban the import 28 varieties of snakehead into the United States. Why it hasn't passed yet astounds me. Probably tied to some sensitive trade issues with China. Lord knows we wouldn't want to piss them off and cut off our supply of crappy products. Of course, outside of our Mid-Atlantic region, snakeheads have already been found in the ecosystems of California, Florida, Hawaii, Maine, Massachusetts, and Rhode Island. Watch out - the walkin' fish may be coming for you next. I've always wondered what happened to the guy who dumped the fish in the first place. I'm sure the state of Maryland fined the living crap out of him. But maybe it didn't end there... I have this vision of a group of angry fishermen tying him up and going all "Clockwork Orange" on him. To this day, he's probably locked in a room with his eyelids held open, Snakehead Terror screening over and over again in a very evil continuous loop. If he ever gets out, Bruce Boxleitner - you better watch out! Wow... first I have heard of this! You seriously NEED to send this little honey into a publisher - good story... true story, we need to get you published.